Bertazzoni show again that they can produce beautiful cookers with an eye on performance. 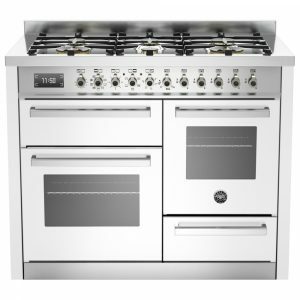 Fantastically stylish finished in stainless steel, it features a flexible multifunction oven, conventional oven and gas hob. The energy efficiency rating on this model is A/A and it comes with a two year parts and labour warranty as standard. Cook in style with this fantastic 90cm wide range cooker from Bertazzoni. This Italian made, stainless steel model features one large capacity electric oven which gives you a whopping 103 litres of space. Plus, teamed with the 10 cooking functions, whether you're cooking pizza or Sunday lunch your food will be cooked beautifully. The five burner gas hob with cast iron pan supports gives you plenty of space to cook up a storm and thanks to the full width storage drawer, you'll have the perfect place to store your baking trays or utensils. You'll also be pleased to know that the MAS90-5-MFE-S-XE has been rated A for energy efficiency and it comes with a two year parts and labour warranty as standard. 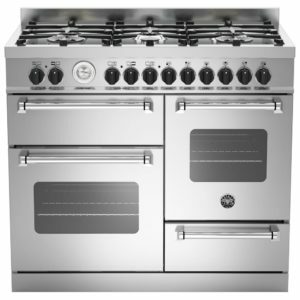 Full of features, whether you are a confident cook or a novice, this range cooker from Bertazzoni works for you. With great flexible cooking options including a multifunction oven, conventional oven, grill compartment and 6 burner gas hob you can be sure that there is a cooking option that fits. The energy efficiency rating on this model is A/A and it comes with a two year parts and labour warranty as standard. 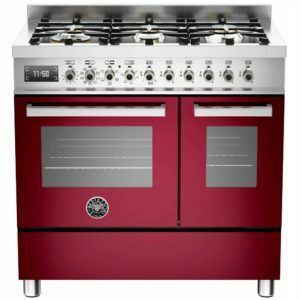 Bertazzoni show off their signature style with this amazing cooker. 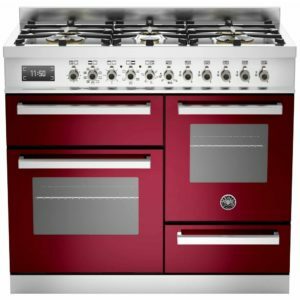 If you want a stunning centrepiece for your kitchen and a cooker engineered for performance, one which will add a professional touch to your cooking - then here it is, in all its dazzling glory! It offers all the space you could ever need with 107 litres of oven capacity split between two ovens. The main oven has 9 cooking functions including a very Italian, pizza cooking option! The second oven has 4 cooking functions whilst both ovens have a grill. A clever storage area utilises the space below the ovens for all your cooking paraphernalia. Triple glazed doors keep the heat in and the exterior cool. 5 gas burners round off this brilliant piece of culinary excellence. Bertazzoni have managed to create a range cooker that is solid and functional and yet elegant and chic at the same time - genius! 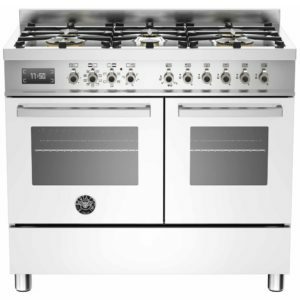 This fabulous dual fuel range cooker from Bertazzoni is full of style and flair. Offering all the space you could ever need with 123 litres of oven capacity split between two ovens, the main oven has 9 cooking functions including a very Italian, pizza cooking option! The second oven has 4 cooking functions, and both ovens contain a grill. A clever storage area utilises the space below the ovens for all your cooking paraphernalia. Triple glazed doors keep the heat in and the exterior cool. A 6 burner gas hob rounds off this brilliant piece of culinary excellence. Bertazzoni have managed to create a range cooker that is solid and functional and yet elegant and chic at the same time - genius! 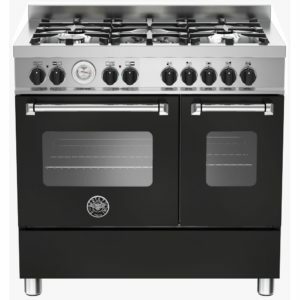 This fantastic range cooker from Bertazzoni just oozes style, finished in black with stainless steel trim. There's a clever multifunction oven with nine cooking options, including fan assisted, grill and even a pizza option. Topped with a powerful 6 burner gas hob top, you have plenty of space for all your cooking pans. With all these cooking options you will be sure to release your inner chef in no time at all! Boasting a desirable A/A energy rating you can cook up all your favourites while keeping energy bills reasonable, what is not to like? 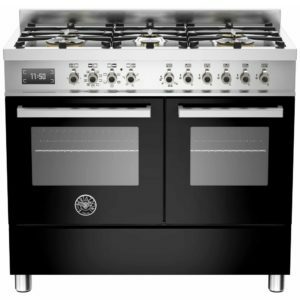 Dripping with Italian elegance and style, this Bertazzoni Master dual fuel range cooker is simply breathtaking. It will dazzle in any kitchen, bathed in an aura of excellence. This cooker is not just an object of beauty, it is a real force to be reckoned with in the pursuit of culinary brilliance. 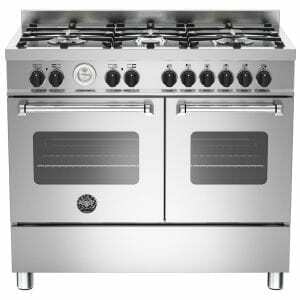 Bertazzoni have engineered this cooker for performance, to bring out the professional chef in all who use it. It has an impressive 123 litres of usable oven space across 2 ovens. The main oven has 9 functions including quick start and, the very Italian, pizza cooking option. The second oven has 4 cooking functions and below is a fabulous storage drawer. 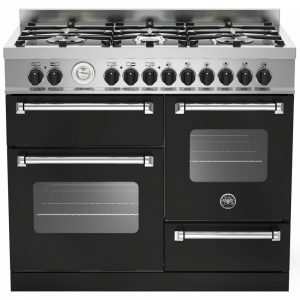 Combined with a 6 burner gas hob, you will have all the space and versatility that you ever dreamed of. If you crave a range cooker that is technically brilliant, durable, reliable and jaw achingly gorgeous, you can relax - you've found it! 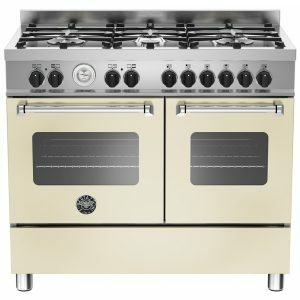 Beautiful and powerful, this fantastic 100cm wide range cooker from Bertazzoni offers great, flexible cooking. With a multifunction oven, conventional oven and six burner gas hob there's plenty of cooking options. Finished in warm burgundy it will create a stunning focal point in your kitchen. The energy efficiency rating on this model is A/A and it comes with a two year parts and labour warranty as standard. 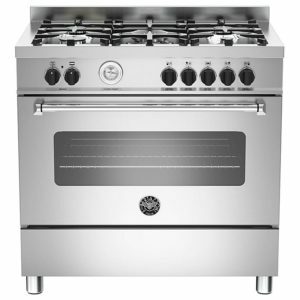 Boasting a multifunction oven, a conventional oven, a separate grill and a six burner gas hob, this Bertazzoni range cooker emphasizes perfomance and style. Finished in white it looks to impress. The energy efficiency rating on this model is A/A and it comes with a two year parts and labour warranty as standard.